From food prep to eating to entertaining, we spend a lot of time in the kitchen. So it’s important that the kitchen window treatment be just right—whether it’s for letting in natural light or providing privacy or just adding style to the space. If you need help deciding what’s best for your kitchen window, talk to a trained specialist at A Shade Above here in Charlotte. We’ll help you find just the right solution. A splash of a pattern can add personality in a kitchen that has simple style and a white color palette. Remember, too, that fabric-based window treatments are a great way to balance all the hard surfaces in the kitchen. Filter light and soften the look of your kitchen with a loose-weave, soft-fabric treatment. For added interest, consider having custom kitchen chair cushions made from the same fabric or color palette. Duette® Top-Down/Bottom-Up Shades can be raised and lowered from the top or bottom as needed. This unique lifting system provides privacy and light control while still allowing you to view the outside. 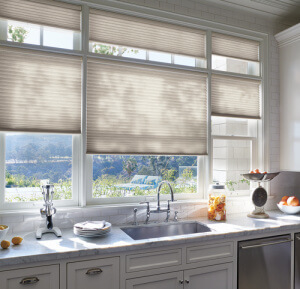 The Palm Beach™ Polysatin™ Shutter from Hunter Douglas is perfect for over the kitchen sink. This shutter is constructed with UV-resistant vinyl, so they’re guaranteed never to warp, crack, fade, chip, peel, or discolor, regardless of extreme heat or moisture. Hunter Douglas Design Studio™ Roman Shades come in over 300 fabrics and colors. They Flat Roman Shades fold up at the top when fully raised and lie flat when lowered, creating a low-profile look that works with a wide range of fabrics and prints. Vignette® Modern Roman Shades by Hunter Douglas offer beautiful 4″ and 6″ fabric folds. They come in 16 richly textured fabrics in five collections with 102 fabric/color combinations. These fabrics are also sold by the yard so a custom “matching” valance can be made.